Returning from a recent trip to Barcelona to deliver a keynote address to International Paper, the world’s leading paper company (this company makes all the packaging for Apple computers – which is new slant on ipaper to ipad) my wife and I drove to Carcassone and stayed a night in a lovely hotel directly opposite the famous Medieval Town of Carcassone. Though first settlers can be dated from 3500 BC, the last 1,000 years have witnessed a rich, intense history throughout the Crusades. That’s a long time in the history of Man. Deep inside the city walls I enjoyed a drink at a café called the Senechal opposite the entrance gates to the palace, the same place I had enjoyed a drink 40 years earlier. That’s a long time in the life of anyone. In 1971, I first travelled to France for romance and adventure. This was a Turning Point itself in my teenage years as both were not up to my youthful expectations. Upon discovering that my equestrian girlfriend had been seduced by the French Olympic equestrian trainer, I ‘borrowed’ the seducer’s GT40 high-performance sports car and enjoyed driving at 240 kilometers an hour, almost blowing the engine. 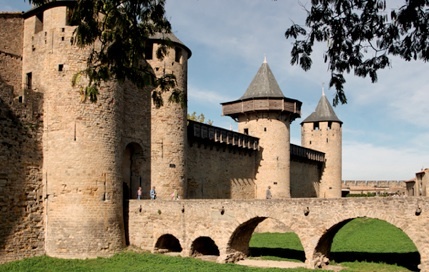 But it was neither the adventure nor the romance I had envisioned, so I hitch-hiked myself away and went to Carcassonne. Sitting at the Senchal Café, 40 years ago I ruminated on my recent decisions and what I wanted to really achieve in my life. I wanted to have a country home like the Olympic Trainer. I wanted to have nice cars. I wanted to have restaurants. I wanted to write bestsellers. And it is a bizarre experience after such a long absence when you find yourself sitting in the same place (I am sure it was not the same chair) looking at the same view (the palace gates, though restored in the 19th century have been constructed of the same stones that have stood there for centuries) and reflecting on what I have done with my life and what I want yet to achieve in my life. You would think that teenager’s eyes would see things differently to grandfather’s eyes, but the amazing thing is that they don’t. Both perceive what they want to perceive. When you make the decision to commit yourself to a partner either in marriage or partnership, and you follow through, then whatever happens, you are still the same person. You will see the world differently, because there are different responsibilities on your shoulders, but you are the still the same person. When you have children and become a father or mother for the first time, you once more see the world differently, but you are still you, the same person. When you become a grandfather, you see the world differently again, but you are still the same person. Whatever life changing elements influence your life for better or worse, you are still you; the person you were born to be. The difference is how you choose to deal with the influences. I believe that for things to change in our lives we have to change. But that does not mean changing the real you, as this is not sustainable. What is possible is making the most and the best of the real you. It means changing the way you respond or react to conditions and circumstances whether within or not within your control. At any one moment we are either in command of our lives or being controlled by others. When you allow something or someone to continue to adversely affect your emotions, such as someone repeatedly irritating you, then you are giving that person control over your emotions. That is what must be changed. When we take command of our lives we are able to change into the person we are really capable of becoming. When you yourself continue to do something that does not make you feel good, then you are allowing bad habits to adversely control you. If, for example, while on a diet, you seek out comfort food because you have been unexpectedly hit with disappointment, then you are allowing your emotions to control you, and that is not the fault of anyone but you. You know you can change; you want to change; yet you stop yourself from changing. Preventing our growth into the best we can be is down to us; it is our prime responsibility to encourage ourselves. It is not to discourage ourselves by failing to command ourselves and then rationalizing that we are only human and deserve a break. So what is the answer? What is it that we can do that will positively stimulate, generate and encourage the change we want, or need, to bring about in both our personal and professional life? We can invest time in re-evaluating what we are about, why we do what we do, how we can improve the way we live our life and operate our business. This is easier said than done, because the former habits do not want us to change. They like the status quo so they persuade you that as the re-evaluation is so important, it is worth putting it off until you can really think about it, which is another time in the future. I was fortunate to experience a Turning Point in my life at an early age: that until we take the time to seriously evaluate and re-evaluate, we will carry on doing the same thing we have always done yet for some insane reason expect a different outcome. During those 40 years I did have the country mansions, the cars, the restaurants and wrote many books. I have fulfilled almost all the goals I made while surveying those historic gates and arched dry-moat bridge leading to the inner walled palace that had already witnessed a thousand years of knights seeking romance and adventure, all determined to get where they are going. There are still a few big goals to go, and though I did reflect on what had been achieved, I took the time to re-evaluate what I still wanted to achieve and why. And that is the main point that I did confirm to myself while revisiting the spot of my first re-evaluation: Whatever it is you really want to be or do (and you have to really want to be or do it) you can achieve it. The person that is going to get you there, or prevent you, is you. You are the common denominator in your life. You are the constant that either builds your character or weakens it. Re-evaluation is a catalyst for Turning Points. Take time to seriously re-evaluate where you are going, why you are going, and how you are definitely going to get there. Consider if what you are doing for 80% of your time is conducive to achieving what you are determined to achieve. This could make the difference. The one that 40 years later you can say to yourself: I got to where I set out to go.